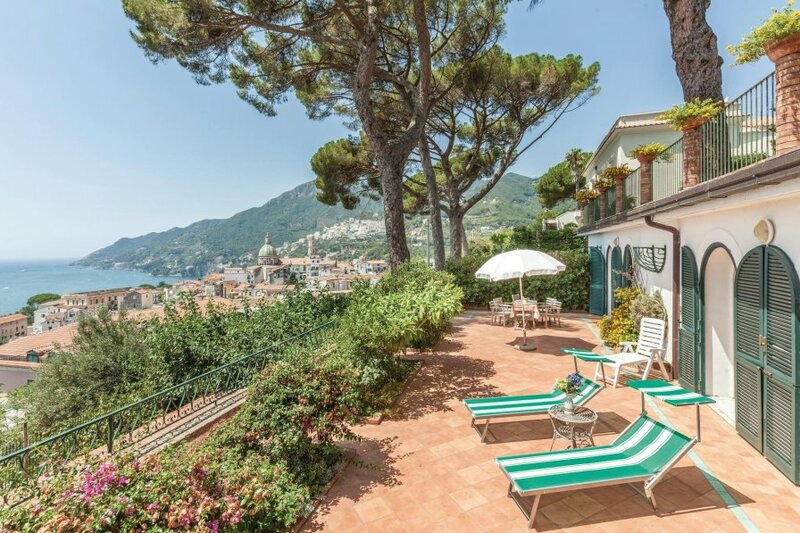 This lovely annex for the holidays with panoramic views of the coast and the sea is located in the picturesque and famous Vietri sul Mare, on the Amalfi Coast. This lovely annex for holidays with panoramic views of the coast and the sea is located in the picturesque and famous Vietri sul Mare, declared a UNESCO heritage site since 19997 and the first town on the Amalfi Coast! The house is situated within a large fenced park and guests have at their disposal a spacious open terrace equipped with deckchairs and a parasol for sunbathing, and a table and chairs for alfresco dining. The accommodation is very bright, pleasantly furnished and at times typical and is characterized by the presence of a maritime pine whose trunk crosses vertically the living room of the house. The very panoramic coastal road that will allow you to visit some of the most famous places in the world, passes to approx. 50 m from the accommodation: Do not miss the opportunity to go to Amalfi (approx. 21 km), Pompei (approx. 25 km) and Positano (approx. 40 km). Vietri sul Mare is a typically maritime town with narrow and picturesque alleys in which to stroll, scattered with shops selling hand-painted ceramics, for which Vietri is famous throughout the world. In this region you will come into contact with an extraordinary culinary tradition, which has its roots in the typical products of the region: “Scialatielli” (pasta dish) with fresh tomato and clam sauce, fish “all’acqua pazza”, but also pasta and desserts based on lemon and then of course the limoncello (liquor) produced with the famous lemons of Sorrento! A local railway line passes near the house. Arrivals and departures outside the scheduled times must be agreed with the owner at least two weeks before arrival. The agent has rated it as a three star property so it is a well-kept villa, equipped with standard furniture. It is also good value for money. This villa has sea view and is located in Vietri sul Mare, only 300 metres from Vietri. It is set in a very convenient location, just 300 metres away from a sandy beach. There's also a restaurant only 300 metres away. The villa has free wireless internet. You can also park on-site at no extra charge. The villa is well equipped: it has a refrigerator, washing machine and dishwasher. It also has a garden and some garden furniture outside.